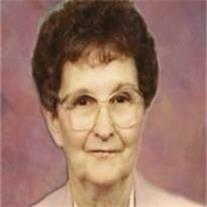 Mickelson, Ruth Adelia Lillywhite of Mesa, beloved wife, mother, grandmother, and great-grandmother, died in Mesa, AZ on Nov 9, 2011 at the age of 93. Ruth was born in Mesa on Feb 24, 1918 to Horace and Georgana Lillywhite, members of pioneer ranching and dairying families. Ruth was the oldest of their five children. She married Morris L. Mickelson in May of 1941, in the LDS Mesa Temple. Always active in the Church of Jesus Christ of Latter-day Saints, Ruth gave a life time of service in her assignments. Ruth and Morris enjoyed their missions to Ireland and Ohio, along with working many years in the Mesa Temple. Besides caring for her family, Ruth owned her own printing business, and then worked as a secretary for the Church Education System for 12 years. Ruth and Morris are parents of seven children: Marvin (Joyce), Elaine (Jared) Huish, Susan (Jon) Meilstrup, Gerald (Cari), Morris (Susan), Donna (Dave) Lamoreaux, and Grant (Karla). She is survived by her 7 children, 43 grandchildren, 71 great grandchildren and 2 sisters, Beth Osborn and Helen Poulson. Her life was one of loving service devoted to her family and God. She was always a loving mother with tender hands and a caring heart. She will be greatly missed by those she touched. Her family expresses appreciation to those at Pleasant Living Assisted Home, who have gently taken care of her. Services will be held Sat, Nov. 19, 2011, at 10 am at the LDS church building at 940 E. Southern Ave., Mesa, with a viewing 1 hour prior. A viewing will also be held on Fri. the 18th at Bunker’s Garden Chapel, 33 N. Centennial Way, Mesa 6-8 pm. Interment will be at the City of Mesa Cemetery.